A Worthing man has been convicted of murdering a girlfriend and killing another, after a five-year fight for justice from one of the victim’s families. This afternoon, Robert Trigg was found guilty of the manslaughter of 35-year-old Caroline Devlin on March 26, 2006. After less than a day of deliberations, the jury at Lewes Crown Court also found Trigg guilty of murdering another girlfriend, 52-year-old Susan Nicholson on April 17, 2011, after a two-and-a-half week trial. The 52-year-old had said he woke to find Ms Nicholson dead on the sofa, five years after he claims he woke up to find Caroline dead in bed. The case came to court after Ms Nicholson’s parents fought for five years to get the police to re-open the case after an inquest in 2011 and made numerous complaints to the Independent Police Complaints Commission (IPCC). Initially Ms Nicholson’s death was recorded as accidental following a coroner’s inquest, and Miss Devlin’s was recorded as natural causes. Ms Nicholson’s family finally secured a new post-mortem, which cast doubt on the original coroner’s verdict. 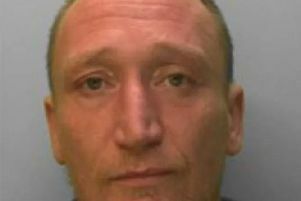 In both deaths, at different addresses in Worthing, former chef Trigg did not call the emergency services after finding both women dead in an ‘unusual position’. The prosecution said there were ‘significant similarities between the two deaths’ of the two women. Trigg denied one count of manslaughter and one count of murder and on Monday this week he refused to take to the stand to give evidence in his own defence. Wearing a long-sleeved shirt, Trigg looked shocked in the dock as the verdicts were read out. Speaking after the verdicts, Judge Justice Ingrid Simler thanked the families of the two victims for their ‘dignity and respect’ during the trial. Trigg was remanded in custody to appear at Lewes Crown Court for his sentencing tomorrow morning. Following the verdict, Nigel Pilkington from the Crown Prosecution Service said: “This was an extremely unusual case and required us to put together a compelling case in the face of initial pathology results that suggested the victims had died of natural causes. “With the benefit of knowing the wider picture, this allowed the pathologist to now consider what else could have happened on those fateful nights, with the results telling a very different story. “Aside from the new post mortem results, our case also considered the striking similarities between the cases, with both victims found in an unusual position and Trigg failing to call the emergency services, instead getting other people to do it for him. His accounts then raised far more questions than they answered. “The introduction of bad character evidence, including incidents after the deaths of both Caroline and Susan also supported our case, as it helped to build a picture for the jury of a man with a history of violence and controlling behaviour towards his partners.